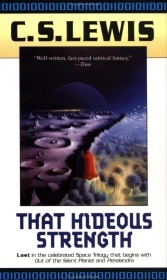 Third in Lewis’s Cosmic Trilogy, That Hideous Strength is longer than the two previous volumes combined. It is also very different from them in several aspects. The first noticeable difference is, I believe, in readability. The book is written in a much more fluent style, and it is easier to read; combine this with the plot, which is often highly absorbing, and the result is almost a page-turner. That Hideous Strength describes an attempt to build a modern Tower of Babel in England during the 1940s. A “scientific” institute called N.I.C.E. (“National Institute of Co-ordinated Experiments”) -- headed by the friends of Dr. Weston, familiar to readers ofthe first two books -- tries to establish complete human control over nature, including the face of the Earth and the human body itself. The time was ripe. From the point of view which is accepted in Hell, the whole history of our Earth had led up to this moment. There was now at last a real chance for fallen Man to shake off that limitation of his powers which mercy had imposed upon him as a protection from the full results of his fall. If this succeeded, Hell would be at last incarnate. Bad men, while still in the body, still crawling on this little globe, would enter that state which, heretofore, they had entered only after death, would have the diuturnity and power of evil spirits. Nature, all over the globe [...] would become their slave; and of that dominion no end, before the end of time itself, could be certainly foreseen. N.I.C.E. controls the press, and only a small group of people -- “The Logres”, as they call themselves -- really understand what is going on, and hope to stop it. But they do not know how. A young couple, Jane and Mark Studdock, finds itself on different sides of the divide. Mark joins N.I.C.E. as a better alternative to his former job as a college professor, and he apparently refuses to acknowledge what he encounters there. Jane, on the other hand, realizes she has the unique ability of “dreaming true”, or seeing real events in her dreams, and she is recruited by the Logres. As part of the general improvement in the quality of writing, the characters in That Hideous Strength are remarkably much more believable, and certainly much less trivial. Jane and Mark are probably the prime examples, but other characters are also well-developed. This is a very refreshing change over the two-dimensional characters encountered in Out of the Silent Planet and Perelandra. The evil characters, however, are rather flat, apparently on purpose: each is a caricature of a man with a single evil trait taken to the extreme, with indicative names like “Frost” and “Wither”. But much as the writing style improved, the book is lacking in depth. Sadly, this third volume does not provoke thought nearly as much as its predecessors did. It does not offer a serious philosophical debate. In Perelandra, Lewis argued that a scientific replacement for religion would be an evil thing. Here, this is taken for granted. And it almost seems as if Lewis not only opposes pseudo-scientific philosophies, but also anything modern in general; old, “traditional values” are deemed clearly superior to any modern thought, for example in family lives. A few scenes do offer some food for thought; personally, I think the best one is the part in Chapter 15 where Mark is being tested before being fully “initiated” into N.I.C.E. Suddenly, he finds that he cannot openly reject Christian symbolism which he previously believed meant nothing to him. Yet even this discussion on the meaning of symbolism in religion is hardly a compensation for the relative lack of depth in the book. And while most of the new characters are reliable, we find our hero Dr. Ransom elevated from the status of a mortal to become The Pendragon, heir to King Arthur and a human being who is not destined to die -- an awkward transformation to say the least. The result of these two opposing trends (in the quality of writing and in the depth of the debate) is that many readers of the Cosmic Trilogy consider it to be the best of the three books, while others regret that it was ever written. In my opinion, neither viewpoint is right -- it is simply a different kind of a book by Lewis that happens, plot-wise, to be the sequel of the two others. A suspicion which had crossed her mind once or twice before now returned to her with irresistible force -- the suspicion that the real universe might be simply silly. A Trilogy in Four Parts? There’s an ongoing debate regarding the hand-written manuscript of a book called The Dark Tower, which some claim was Lewis’s original draft for a the third volume in The Cosmic Trilogy. The draft is radically different from That Hideous Strength. However, others believe that the unfinished manuscript was faked by Walter Hooper, who worked with C. S. Lewis for a short period in 1963. More details about this (and about Hooper and his work with Lewis) can be found in The C.S. Lewis Hoax, a book by Kathryn Lindskoog; and in the alt.books.cs-lewis newsgroup FAQ. This is by far the densest of the 3 books. The fact that you find it to be the opposite shows how much of Lewis's genious was lost on you. You should try reading it through a second time. Your insinuation that the people who find it be the best of the trilogy are shallow is absurd, as I have found the exact opposite to be the case. I would suggest that you read Lewis' The Abolition of Man. I suspect that you would understand better what Lewis was trying to accomplish with That Hideous Strength then. I suppose the reader has to have a broader understanding of all the different concepts and ideas that Lewis was referencing to see how significantly much more depth there is to this book than the prior two. I have to agree with Chris. The book is far more dense than the first two combined. While totally different than the first two ''out of this world'' mythical stories that clearly portrayed good versus evil, this book's objective is to continue the ethical battle on our planet Earth. I would also suggest rereading this book or possibly reading some of its positive literary criticism to gain some alternative views. Perhaps you do not get reviews from the authors themselves, this being an exception. When I first wrote ''Graven Image'', a satisfied reader directed me to CS Lewis, ''That Hideous Strength.'' For years, I remembered the recommendation but really did not pursue reading Lewis' work as I knew quite well, how original and ground breaking my novel was. I now consider that to be a mortal frailty of my own, as I've always known of the mastery in writing that Lewis possessed. Nothwithstanding, I see why the comparisons were made just as I know how extraordinary the modern day definitions will one day rock the world of current opinion, once the ancient truth about graven images are revealed. I now realize that Mr. Lewis did not know how close to reality he actually was when he said in 'THS', I quote: ''Bad men, while still in the body, still crawling on this little globe, would enter that state which, heretofore, they had entered only after death, would have the diuturnity and power of evil spirits.'' Following 14-years of research, one published novel, speaking engagements, radio and television interviews, I am more clear about how correct Mr. Lewis was than ever, at least about the power possessed through the creation of graven images, the same that are forbidden in the Ten Commandments, which so few on earth today, have any understanding of whatsover...but I fear, are about to! I do not believe you can understand the full depth of this book with out being a Christian, and being one I do not even catch all the underlying themes. You could study the bibble and this book all your life, and still you would not get it til you became a Christian. I do not mean to upset you when I say that I COMPLETELY disagree with what you have said (Jacob). Though a Christian myself, I do not think that you have to believe in God to ''understand'' this book. You would probably have to be a Christian to ''agree'' with what Lewis is saying but whether you understand it has not to do with faith alone. All that being said I will also say that it is understandable that a Christian would more easily ''appreciate'' the trilogy in all its glory. C.S. Lewis is simply awesome. 1: The only way to be truly objective is to be utterly indifferent, thus, inhuman and/or dead. 2: Good and bad may not have always been as polarized as they are now- there were once more shades of grey. 3: The educated know less than they think. Also- the call to traditional values is there, but also, sometimes it strikes me almost a call to return to the innocence of earlier days. Still, a pretty good review with limited bias on the author's part. This is a very difficult book, and I'd like to echo the fact that the same argument is put much more clearly in ''the Abolition of Man''. I do find the whole Arthur and Merlin thing a rather disappointing way to end it, as it seems unnecessarily mythical, but it is an indication of how far this book, like the other two, is indeed driven more by ideas and theology than by character and plot. The book itself is Myth, by Lewis's standards.If you've read things such as Myth Became Fact and On Science Fiction, etc. you will realize that his goal is to write myth. Admittedly, the Authurian legend caught me by surprise, but it's inextricable from the story- it's thoroughly Lewis. I found THS to be a nearly-prescient warning about where a rationalist, secular society is bound to wind up. It's a far stronger book, IMHO, than either of the others. I always thought OOTSP was next thing to a fairy tale, heavily influenced by H. G. Wells or Verne. It reminded me of 'First Men on the Moon', with a Christian viewpoint. Perelandra was a retelling of the events that surround the fall on earth, Venusian style with Ransom saving the day for the Lord. I liked them both, don't get me wrong, but for me, THS can be like reading the newspaper sometimes. I've always wondered if Lewis knew anything about Scientology; the meters that are mentioned as part of Belbury sound a lot like the auditing equipment the Scientologists use. In fact, (I have a family member who was involved with the Elronners [Thanks, R. Heinlein]), a lot of it feels that way to me. I think the power of THS is that is takes Christian theology and puts a whole different twist on it. It is almost as though he is taking Christian concepts and having his secular characters of Mark and Jane stubble upon them and try to piece it together without ever being directly told any theology/''religion.'' Also it is an excellent work of science fiction, I love how he throws in old with new: Merlin's time travel along with Filostrato's technological prowess. Overall its a great book that does get one thinking. I think the point Lewis is trying to get across to the reader in THS is not necessarily putting a new ''twist'' on Christianity, but revealing the fact that God meant for our ''religion'' to be our lives. He is supposed to permeate every portion of our being. He called us to Himself, we have no choice in the matter; it's all or nothing, to use a cliche. Thanks to everyone above for interesting comments - a real pleasure to find this site. I found Tal's original review intelligent, well-informed and fair, even where my feelings about the text differed somewhat. Just one thought in response, to Tal's views and others - no one has mentioned Charles Williams and the effect his ideas, beliefs and literary tastes had on Lewis. Williams' novels, such as The Place of the Lion and The Greater Trumps are worth a look in this connection, I think. Peter, thank you for your kind words and for the pointers. I'll make an effort to read Charles Williams' works that you mention above. I completely agree. Lewis was admittedly influenced by Williams and loved his writings more than almost any other's. Williams' science fiction, as well as The Abolition of Man are key reads in fully grasping Lewis's intent with this novel, I think. I am re-reading That Hideous Strength for the umpteenth time and just though I'd look up some reviews and discussion. CS Lewis is my favourite author but I am aware that it is possible to place a much loved artist above criticism,( I don't think Lewis himself would have wanted to be put in that position) and re-reading any work is bound to bring up some of its flaws. It is quite different form the first two books, I have alwasy found it both better and worse; it lacks the beautiful simplicity of OOTSP and the monumental theme of Perelandra but it is (largely) more down to earth in the two main characters and presents the temptation of Mark through his desperate desire to be included the 'in crowd' beleivably. There is more humour too in the scene where the speech of the gathered throng is confused: 'Bundlemen, bundlemen' and 'Blotcher Buldoo? 'are memorable, as well as horror in the judgements on the NICE members. i would think that readers who are intregued by the underlying themes would do well to read his straight forward Christian apologetics,including Mere Christianity. Dave, I think your comments precisely define the differences between the three books of the trilogy, including the humour of the 'Babel' scene. I always enjoyed Lord Feverstone's calmly intelligent solution of _writing_ a note and also the way it was defeated; perversely, I also (I wonder if anyone else experiences this?) feel a twinge of regret when the great earth wave crashes down on Feverstone when he is close to escaping. Of all your observations, the one about the danger of placing an author like Lewis above criticism meant most to me - I could just about date the beginning of my literary critical maturity from the moment it crossed my mind that Lewis might not have all the answers, or that if he did, they might be based on less-than-perfect thinking. Doesn't affect my love of his books though - it is his cheerful spirituality and eerily-familiar descriptions of the marvellous which constantly bring me back to his writing. Today I just discovered a worldwide movement that follows NICE's ideology, but without the infrastructure. Here's a link about the movement: http://en.wikipedia.org/wiki/Transhumanism . They have their own website too at http://humanityplus.org/ . Crazy, huh! ?